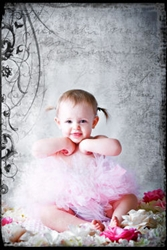 Would you like your little one to have a photo like they were laying in a bed of flowers? Here is your chance! This beautiful pink and white silk flower mat is covered with silk flowers large and small! The mat is minky which will be soft on the baby or toddler as they lay on the mat! The mat is also padded with cotton for extra softness!